First of all – Prague is very „walkable“ city, so if you´re accommodated in the city center or very close, you don´t need to use the public transport nor taxis very often. Prague public transport consists of the underground, trams an buses. It´s all run by one company so you can use the same ticket for all the means of transport. Plus few specials – there´s a funicular going up to the Petrin hill and a little ferry on the Vltava river which are part of the public transport system as well, so you only pay the public transport ticket there. ...or subway, tube or metro, however you want to call it. In Czech it´s called metro therefor the sign marking the station is the capital M with an arrow pointing down. Prague metro only has 3 lines, red, yellow and green, so the sign is always in the colour of the line. It will probably be one of the smallest underground system you´ve ever seen but it´s very efficient, fast, clean and cheap. It goes every day since approx. 5 o´clock till midnight. 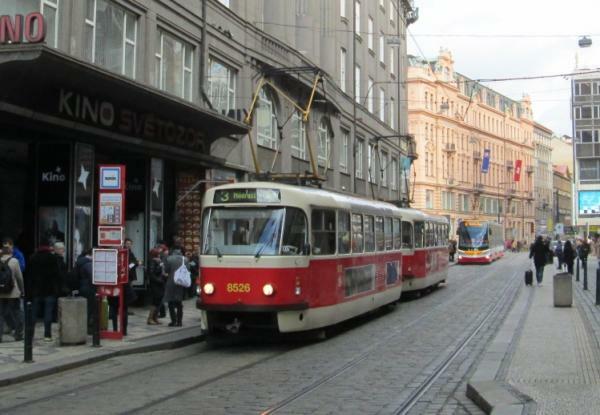 There are several types of trams going through Prague. In my opinion they are better for the tourists as you can look around and continue with the sightseeing. Unfortunately, there´s not any circular line, so you always have to go „there and back again“. The best „tourist line“ is nr. 22 which goes in the city center (crosses the bridge next to the Charles bridge, goes up to the Prague Castle etc.). The trams go 24 hours a day – the day lines (1 – 33, but not all the numbers in between are taken) go since around 4 o´clock till around midnight, the night lines (51 – 59, black numbers on the stations) go midnight to 4 o´clock. The buses usually go on the suburbs or in the further center so you probably won´t meet them very often. Their operation hours are about the same as the trams. Important note – you cannot buy the ticket at the driver, you have to have it before you get on the underground train, tram or bus. You can buy them at the newspaper shops, in the vending machines or in the underground stations. Many hotels sell the tickets at the receptions or concierges. It´s not all when you buy it – you have to validate it either when entering the underground station or when entering the tram or bus. Use the little yellow boxes as on the picture, it will put the time-stamp on it as all the tickets are for a given period of time. 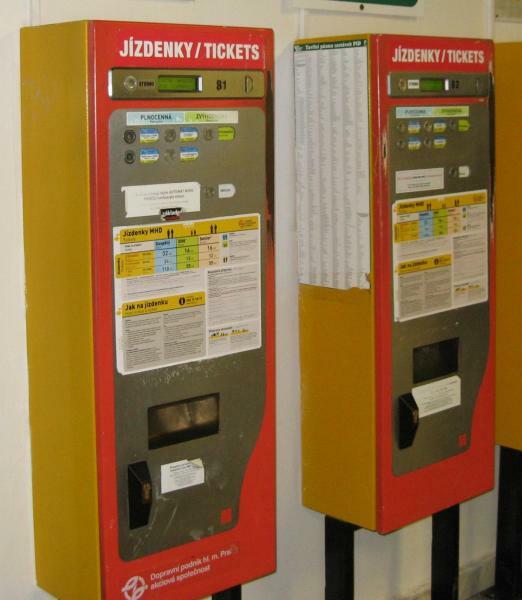 30-minutes ticket for 24 CZK (approx. 0,9 eur). It´s good enough for most of the journeys. 24-hours ticket for 110 CZK (approx. 4 euros) – perfect if you don´t stay in a walking distance from the center. You validate it only in the first mean of transport and then it´s good for 24 hours (so let´s say 2:30 pm on Saturday till 2:30 pm on Sunday, not for the date only). 3-day ticket for 310 CZK (approx. 11,5 eur) – again it´s valid for 3 x 24 hours, not for 3 dates. Note: the article was edited in February 2017, the prices might differ slightly. 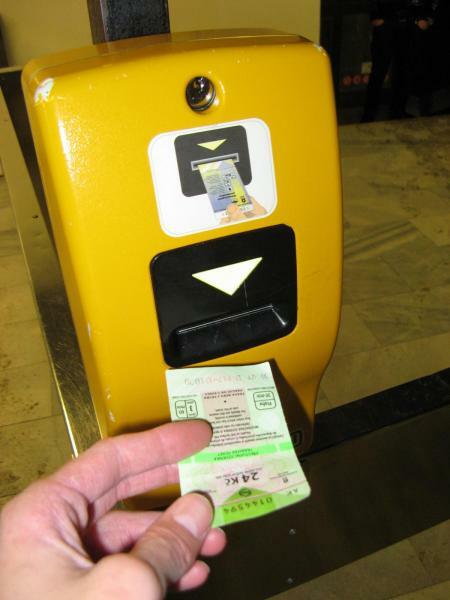 There are only random ticket inspections, so don´t be confused when you don´t have to show the ticket to anyone. Don´t worry about the timetables: during the workdays the metro goes every 2 – 5 minutes, during the weekends every 5 – 10 minutes, depending on the time of the day. The trams go every 5 – 10 minutes during the weekdays and 5 – 20 minutes during the weekends. But if you want to have everything under control, try to figure it out at the stations or check it online at the Public transport company website . You need to know the name of the start and final stop of your journey. The diacritics (our special Czech characters such as š č ž ř don´t matter). If you order the tour with me, you don´t need to bother yourself, I take care of all connected with the transfers!